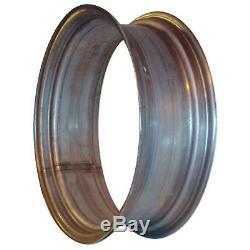 One New Aftermarket Replacement 8" X 24" Rear Rim that fits John Deere Tractor models: M, MI. Blank Center, Must Weld In Old Center. Replaces Part Number: WHP60-0027, WHS040. We carry parts for Engines, Transmissions, Front & Rear Axles, Hitch & Drawbars, Undercarriages, Final Drives, Seats, Bearings, Cups, Cones, Seals, Discs, Couplers, Gears, Brakes, Pressure Plates, Pilot & Throw Out Bearings, Ring & Pinions, Gaskets, Decals and MORE for most high wear items. We also carry replacement parts for the Boom Cylinder (Seal Kits, Tubes, Glands, Pistons, Rods). The item "John Deere Tractor 8 X 24 Rear Rim M MI" is in sale since Tuesday, March 31, 2015.